2019 Prime Season NOW available books fast!!!!! !Inquire today!!!! The views are amazing!!!! Very open for mingling. NEW OFFERING: Tasty.... Home cooked catering services by request when available. Old school favorites with taste and health in the back of the mind. LAKE***VRBO#473699 'Roamers Cove' and VRBO#629742 'The PlayGround' Lake Francis. VRBO#1060243 "Waterville Chain of Lakes." NOTE: Super Bowl Week Includes Black Suburban Transportation with Driver. Stunning views from a spacious updated rambler on 120 ft. of Prior Lake lakeshore with Panoramic Views! Just minutes from 169 and 30 minutes to downtown. Create lasting memories with generations of family or groups of friends. Enjoy great swimming and fishing right off the dock of a highly sought after recreational lake in the Twin Cities Metropolitan area. After a day of play, retreat inside this fully furnished lake home with 5 bedrooms, 3 Full Baths, Gourmet Kitchen with panoramic lake views. Enjoy a perfect sunset experience while sitting by a campfire. A variety of restaurants and bars and cute downtown shops just minutes away! Plus Golfing, Casino, Amusement Park, Horse Races, Renaissance Festival, Viking/Gopher/Twins/Timberwolves sporting events, and Mall of America nearby. Prior Lake is a developing suburb with a small-town atmosphere. Prior Lake features many recreational amenities including numerous parks and lakes that offer year-round recreation. Mystic Lake Casino, located within the Shakopee Mdewakanton Sioux Community (SMSC) Indian reservation, is also in Prior Lake. Golfing opportunities abound in the Prior Lake area, with the Wilds Golf Club, Legends Golf Club, Heritage Links Golf Club, Cleary Lake Golf Course and the new Meadows at Mystic Lake Golf Course all either in the city limits or within a couple miles. All reservations require $1000/wk or 1/2 down deposit which ever one is higher. We will refund your deposit less $50 handling charge if you cancel 60 days prior to your arrival. You will lose your entire deposit if canceling less than 60 days from your arrival. Late arrivals or early departures will be charged for entire reservation. We currently rent the home fully furnished for vacation or long term housing needs. I love the small-town feel of Prior Lake. Our family enjoys being on the water and wanted a place where we share our home with family and friends. My daughters love to feed the ducks and fish right off our dock. Every year, we enjoy watching the baby ducklings grow all summer long. The fishing is also pretty good off the dock! Gourmet Stainless Kitchen Aid appliances including double ovens and 6 burner gas cooktop. A cook's dream! CD / stereo w/in wall speaker system in main floor living room. Ipod speaker docking station. We have a couple Wii games available for use. 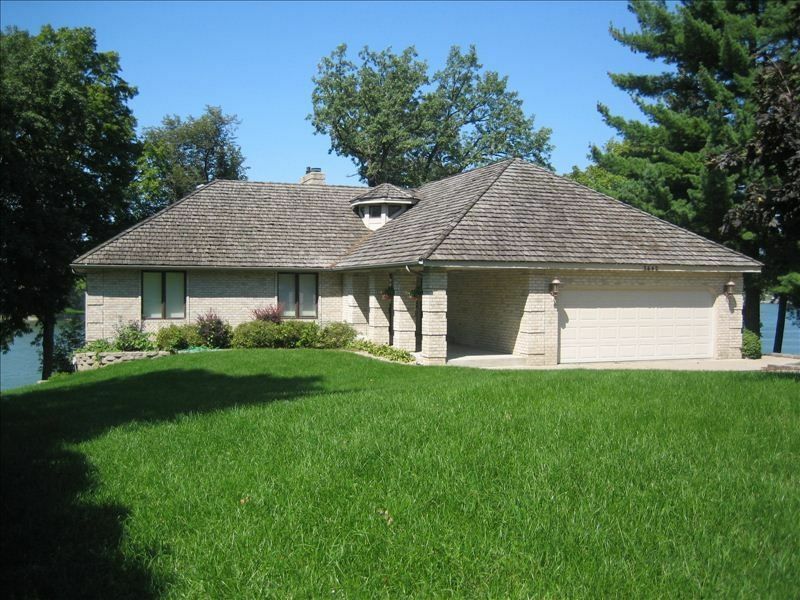 Great, big house and a gorgeous setting on Prior Lake. It was perfect for a group of friends rendezvous at the NCAA Final Four. Beautiful house on a beautiful lake! bit annoying having to share one pool stick) and bar was a big hit especially with the kids (they got to play pretend). we ended up having to stay an extra day due to the overnight snow and high winds; josh was helpful and was always responsive through text messaging. A big thank you to katie for allowing us to check in early as well. We ended up having to shovel around the house. the deck, side steps and lower entrance were all not shoveled. Katie did offer to shovel for us but we didn't want to be disturbed once everyone arrived. There was also the hanging and exposed wires and light from the fan above the stove that I would recommend getting fixed. Thank you for having us at your lake house and hope to rent with you again! Property was beautiful, spacious and great scenery. We were disappointed with the heat in the house, it wasn’t kicking on and had to use the garage heater to heat the main level for majority of the stay. Contact’s were responsive with questions however both contacts were out of state/country. Lots of space for everyone and two large areas for entertaining. Lots of kitchen utensils and supplies for cooking. This home on Prior Lake was perfect for my planning / team development meeting, having this home brought the best of the indoors and outdoors together. We were able to accomplish our goals on planning for 2019 and realizing some fun team building activities both indoor and out. We took advantage of the recreation activities offered by this home and it's great location on the lake. We enjoyed the pool table and games provided by the home and iced fished (maybe not so well) but it provided us another activity to grow closer as a team. Although we had hoped to go snowmobiling we still enjoyed the weather and home. The open home design allowed for free conversation as we gathered around the kitchen island, we found the kitchen perfect for cooking most of our meals allowing each of us to take turns creating meals. Most of us fought over breakfast and dinner (eggs, bacon and something off the grill at night), the double oven and cook top were awesome to use. The owners had left a book about the local restaurants, it made it easy for our group to decide on where to eat on our last night stay, to have something prepared by others while we all got to enjoy the moment. I can only imagine what this property is like in the summer time and I hope to in the near future! Nice home and very nice layout. There was room for everyone. Everyone enjoyed the kitchen and the family area in the basement. Prior Lake is a developing suburb with a small-town atmosphere. Prior Lake features many recreational amenities including numerous parks and lakes that offer year-round recreation. *Golfing opportunities abound in the Prior Lake area, with the Wilds Golf Club, Legends Golf Club, Heritage Links Golf Club, Cleary Lake Golf Course and the new Meadows at Mystic Lake Golf Course all either in the city limits or within a couple miles. * A variety of restaurants and bars and unique shops just minutes away! Plus Casino, Valley Fair Amusement Park, Canterbury Park Horse Races, Nascar, Horse & Hunt Club, Renaissance Festival, MN Zoo, Buck Hill Ski Area, Viking/Gopher/Twins/Timberwolves sporting events, Concerts, Theater, Indoor Waterpark and Mall of America nearby. Rates are subject to change until reservations are confirmed. Cancellation policy is 60 days prior to check in for refund.